Depressing weather. Fascinating city with a history like no other in the world. Great Berlin walk with Wouter. Too late to go to Reichstag. A relaxing dinner in our hipster-ish hotel Catalonia. Saturday, Feb 13. Leaving Berlin. Barely make the connecting flight in Rome. Our personal guide Kamal is waiting in a suit and tie and a fine cashmere overcoat. Very formal. Big comfortable SUV. The drive through Casablanca reveals a usual busy large city. White buildings befit its name. The hotel is disappointing. We are somewhat grouchy. We follow Kamal’s recommendation for dinner in an excellent and inexpensive fish restaurant. The place is lively, full of locals. We share salad, a plate of lightly fried anchovy, and a fish tajine. It is light and flavorful. A pleasant waiter takes care of us. Kamal waits outside when we emerge after dinner. So this is what a personal tour is: a chauffeur at all times. I am not sure I am ready for this. He gives us a ride along the waterfront, lets us take a stroll on the famous Cornish, we drive again, takes us to an ice cream place. His consciousness of prices is reassuring. Still, he is so formal. After a 9 AM pickup we visit the great mosque of Hassan II, built only a decade ago. It is square, not a more typical round, apparently Barber architecture. It is imposing in its size and decorations and certainly the detail is beautiful but somewhat it does not have the lightness of other great mosques Philip has seen in Turkey and elsewhere. It does not compete with Blue Mosque in Istanbul. The woman local guide gives the impression that she does not want to do this work and as we find out later she does not know much about the subject matter. I learn an interesting piece of information: humidity absorbing finish on the columns prevents rust on metal chandeliers: the ancient receipt of limestone, olive oil, egg yolks and something else. The great plaza surrounding the mosque is in trouble with water drainage. In several places tiles are coming off. They need a Dutch engineer. We visit a small synagogue, perfectly proportioned, and built in 1949. Interesting that is was built right after the establishment of the state of Israel, just as the Moroccan Jews were seriously planning emigration. It takes a while to get out of the city. Kamal points out buildings from the 20s and 30s, very different architecture. The former is all about interesting design, the latter is about comfortable large apartments. It is an hour drive to Rabat. Nothing to say about the landscape. Mostly agricultural fields. We are taking a highway, no villages along the way. Upon arriving in Rabat we have lunch at a simple place: a delicious soup and a shawarma sandwich. 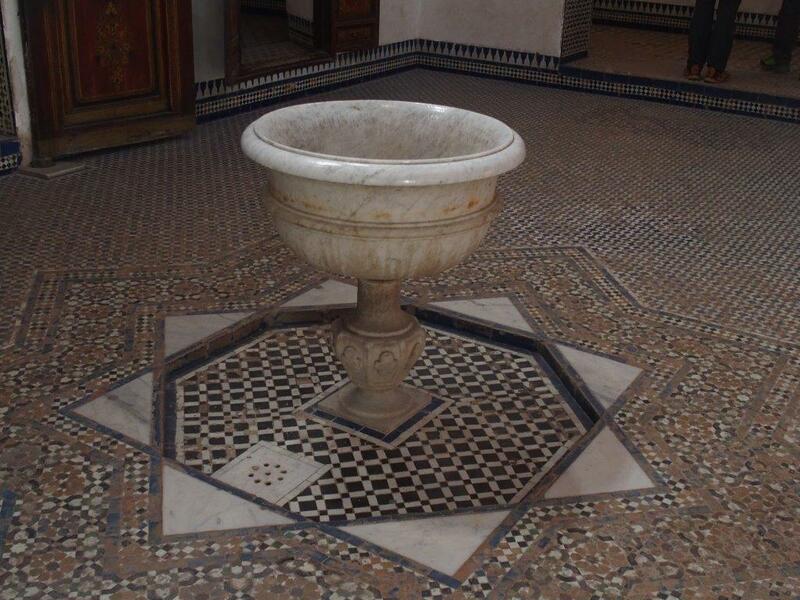 Rabat has a rich history of various dynasties of Berbers, until 17th century. Arabs invaded Morocco in the 7th century (?). Great influx of Jews and Iberian Muslims in the 15th century. I cannot get it quite straight. But one thing is already emerging: the distance between Arabs and Berbers in this country. Kamal’s comments that the identity and belonging in either group matters. He is half Berber but identifies himself with Berbers, and though his wife is Arab this does not stop him from commenting on Arabs’ laziness, etc. We will later find out that all our local guides and guest house managers are Berbers. The royal palace is located in a huge open space. Nothing notable about the building itself, we cannot come closer. There is nothing interesting here. We quickly move on to Chellah, a botanic garden built by the French on the site of Roman ruins and a burial ground of some long-ago Moroccan royals, and the French botanical garden. A local man gives us a tour, identifying various plants and explaining about the burial customs of Muslims (laying on their right side, facing Mecca). There are security men everywhere, one is sitting in a tree, even though the place is almost deserted. The amazing thing about this place are storks, dozens and dozens of them! They are making this clacking noise. The storks (probably from Poland) spend their mornings at the nearby river, hunting for plentiful fish, and afternoons near their nests here, in the botanical garden. After the botanical garden we visit Hassan Tower and royal mausoleum. It is time for the 4 PM prayer and people are rushing toward the mosque. We watch a clueless German tourist who does not know how that he is not allowed inside the mosque, especially at prayer time, and does not even know that he should take of his shoes as he makes unsuccessful attempts to get in. The best part of the trip is at our next stop at Kashbah of the Oudayas. This is a fortified neighborhood built around a kind of fortress, the headquarters of the notorious Barbary pirates. The story is that these pirates at some point rebelled against their masters and protectors (some European royals, probably Spaniards) and decided to become an independent nation. But this lasted only a dozen or so years because once free to govern themselves they were unable to overcome their ethnic and religious differences, started internal fights and were quickly vanquished. This is an old story. Kamal leaves us alone here and so we lose ourselves in the maze of alleys, with blue walls shining in the afternoon bright sun. A boy of 20 with a sweet smile leads us around, pointing to Portuguese doors dating to 14th century and explaining that the blue color deters mosquitos (I wonder if that is true). This is fun. We get to the top of the fortress which offers a spectacular view on the Atlantic. After a short break at Café Maure for tea and sweets we find Kamal impatiently waiting in the car. We still have 3 hours of driving to Fes. The roads are good, there is little traffic, we see many cork trees, nothing special in the landscape. We arrive at 8 PM at Riad Myra, which is an amazing old place in the Moroccan style, beautifully restored, with splendid mosaics, painted wood and elaborately decorated plaster covering the ceilings, columns, walls. It is all about symmetry and unity. There is a courtyard in the center with a fountain, and the guestroom suits on the ground level open directly into it. There are no windows to the outside. The rooms upstairs, including ours, open into a balcony gallery that runs all around the interior of the building. In the past, this house was occupied by an extended family and each suit belonged to one family unit. The downstairs rooms were occupied by those with the highest rank (first-born son, the patriarch of the family, the most influential wife and her children, and so on). The upstairs suits were for lesser ranking family members. I notice that there are four narrow winding staircases, each in the corner of the house, and that there are numerous small rooms scattered along these staircases. My guess is that these rooms were for the lowest ranking family members, such as unmarried women and servants. Our room is a huge suite with an imposing canopy bed, all carved and decorated. A great big bathtub. Kamal clearly upgraded us, after the complaint about hotel in Casablanca. They serve us a tasty dinner of harira, tajin and wine in the main room. We are terribly tired; this was too much for one day. We see no signs of other guests except for nine big, heavy, middle aged loud Israeli men with shaved heads. I decide that they work for the intelligence service. By now we had enough adventures for one day, but this is not over. Around 9 PM a huge storm breaks out. The wind is howling and there is a deluge of water coming down. Back in the room I can hear this repeated banging coming from the roof, somewhere high above us. After a while I decide to check it out. Narrow stairs lead me from the gallery to the roof terrace where I tightly close the door which has been left open. Then I go to the opposite side of the building and do the same things with the second open door to the terrace. Well, I should have thought better of it: that in the weather like that these two pairs of door were open. Of course, it turns out the manager, the mild mannered Ibrahim, was on the roof fixing something against the wind, and I locked him out. Poor Ibrahim, in this huge rain, yelled and yelled until someone (not me) apparently heard him and rescued him. The next thing I know, Ibrahim is calling us, laughing at the top of his voice, telling me what happened. Very embarrassing, but also very funny. We fall asleep instantly, totally wiped out. At breakfast we see two of the nine Israelis. As always, watching people and trying to figure out their story, or making it up as is mostly the case, is one of my favorite activities on these trips. This is a whirlwind day in Fes. We start at 10 AM. The weather is not cooperating: it is unseasonably cold with showers on and off all day. But it does not matter so much because we are spending a day in the ancient medina, much of it (the marketplace) covered. Our local guide Khalit has an open face, easy smile, is full of stories and exudes friendly energy. First we drive out of the medina to see the panoramic view of the city down in the valley, perfectly encircled by fortified walls. It is amazing how little has changed here for almost a thousand years. We visit a Koranic college from the 14th century, which must be one of the oldest universities in the world, if not the oldest. The interior courtyard displays spectacular craftsmanship and it is not difficult to imagine groups of students clustering in this courtyard, listening to their teachers. After a tea break at a corner café we go to the 15th century Jewish quarter, Mellah, and the synagogue. Like in other Moroccan cities, this Jewish quarter is located right outside the walls of the royal palace because the king was their protector. The synagogue is no longer in active use but all the pieces are here, including a mikva located in the basement below us and visible though a kind of manhole in the floor. Both guides are accompanying us all day, which for me is too much attention. They are very proud of the war-time history of Jews in this Vichy occupied territory: the king refused to provide French policy with the names of his Jewish subjects. This brings the number of countries that protected their Jew to three, including Bulgaria and Denmark. All were monarchies, with a king, looked upon for moral leadership, leading an opposition. The architecture in this section of the medina is Spanish and Portuguese, with characteristic balconies looking out into the streets. Moroccan house have no windows facing the street; they are all turned inwardly, toward their own atriums and courtyards. We walk the narrow alleys of medina, and its central marketplace section (souk) for hours. It seems like we go in circles, there is really no way of knowing where one is. The guide tells us that there are almost a thousand streets and alleys here, it is a labyrinth. I think that people orient themselves not by some mental map but by remembering the faces of shops and merchants. But there is also a system here, with different sectors being color-coded. I just cannot figure it out or remember, even after Khalit offers an explanation. Massive quantities of fresh food. The guide expands what is what. Massive quantities of handmade goods. And far too few tourists to keep this economy going. We enter a large leather shop that overlooks a huge tannery operation in the yard way down below. Right now the tannery is under renovations so a TV screen shows us the process of tanning. This is all done by hand, generation after generation within families. Dirty work, the waste ends up in the river. The quality of the goods is very high. Beautiful things. The owner says that he is a tanner for generations. I tell him that his hands say otherwise. Hmmm, he offers no explanation. He is probably caught on a little lie. I want to buy two round leader futons, like the one I bought decades ago for Heniek, in Israel. He wants to sell me a leather jacket. It is a beautiful red, with black trim around the collar and the cuffs. Beautiful intricate cut. But I do not need another leather jacket. We leave, I make a mental note to return for the futons. We walk and walk. Have lunch with a local family, inside their home. The house is designed the same way as our palatial riad but very modest, without the artwork. The man, a wife, a unmarried sister, and several children live here, altogether 10 people. The man is very proud of his house and all the generations who preceded him in it. The women stay in the kitchen while he joins us for a fine lunch, dishes and dishes, spicy and mild. Salads, a tajin, stew of cauliflower in an interesting sauce, fresh crunchy fennel, many kinds of sauces. The tajin is served in a very large bowl in the center, and we eat it with pieces of bread serving as utensils. Everything else is served in numerous small bowls. This is a very pleasant unrushed meal. We walk again, run into our lunch host who stops and laughingly offers us lunch. This is very fitting, considering that everything we do here today is going in circles, we retrace our steps, or at least it seems that way. So why not repeat the lunch? We all have a great laugh over meeting him again. At some point we pass a very small door, maybe four feet high. I would have missed it but the door suddenly opens from the inside by a friendly young woman and we see a small child, maybe 4 years old, being gently pushed inside by a mother, who then leaves. Our guide explains that this is a Koran school. They start the children at a very young age when it is easy for them to simply memorize the text. It is not much different from cheders, traditional Jewish schools for boys where they memorized the Torah. The next stop is a rug place. It is an enormous renovated riad. The man is a great salesman, tells unbelieve stories of their “cooperative” whatever that name means to him. Philip tells him at the outset that we will not buy anything. It does not stop him from unrolling about 20 rugs in amazing colors and variety of patterns, some very different from what I ever see in the US. He is watching us carefully for signs of interest. We will not buy but I like looking at these rugs. All wool, no silk. One made of some vegetable material for people allergic to wool. Kilims. All beautiful. We return to the leather shop and I negotiate down the price of the futons. From his original $120 a piece I buy 2 for $160. Later I discover of course that I could buy a good imitation of this fine workmanship and quality for a fraction of the price. But not like these two. They are really beautiful, partly hand-made and with fine detail. He wants to sell me the leader jacket, now the [rice is less than half of the original one, but I do not buy. I do not need another leader jacket. By now it is about 4 PM and we are tired but we still go to the last scheduled stop: ceramics. It is worth it. We watch them make tiles, mosaics, dishes. Unbelievably detailed work! I can appreciate the cost of these things. I can see the mosaics and tables going to very rich people in the US. There is one wall panel, about 3 yards by 3 yards, maybe a bit larger, made of a very fine mosaic. The guide tells me that it costs the US customers $150,000 to have it made and shipped. There is more to explain and show but we cannot take in anymore. We are saturated. Back to the riad. The local guide has been friendly but before we even say good bye I notice that he is not even looking at us, his mind is elsewhere. I guess if you spend your days as a guide, day after day new groups of tourists, it all becomes a moving crowd, not individuals. Dinner at the riad, I am glad not to go out again. But the food is not as interesting as yesterday. The room feels warm and cozy. We see the two Israelis again. They are oblivious to our presence. The maid tells us that we have the best room in the house. Vizier is its name. The rain stopped but it is quite cold. I pulled out from the bottom of the suitcase the yellow down jacket I wore in Berlin. Now, it feels good. Kamal shows up in djellaba, one of these long Moroccan robes with a pointed hood and long slits on the sides that everybody seems to be wearing in this cool weather, in place of the elegant and formal black wool coat he was wearing the previous day. He is so meticulous in dressing that even his robe looks like it has been ironed just before he put it on this morning. After a day of walking in mud yesterday his black loafers are in high gloss. We are all getting increasingly easy with each other, bantering from time to time. There is a small delay in departing the hotel and while I wait in the car I watch an old man sitting at a sidewalk café. Suddenly I miss the unstructured vacations from our past, when we could just hang around in new cities and watch people in cafes, shops, on the streets. This vacation is different. We drive to the Roman ruins in Volubilis. Kamal takes a scenic route, which is more work for him but which allows us to see the country. The landscape is rolling hills, agricultural, bucolic. Kamal deserves credit for taking the time and effort to show us the country; it would be so much easier for him to take the highway. At our destination he hands us over to a local guide shows. The ruins are quite impressive, especially the mosaics. After seeing several of those over the years, especially in Pergamum in Turkey, I am beginning to see the logic of these Roman cities, with their via Appias and patrician homes. A bordello with a detailed sculpture of a phallus is located in the town center. Lunch in a small Berber village. In the market square a small bar, we enjoy very much this kind of lunch. I buy some dried figs for the road. We buy an inexpensive scarf made of Guava “silk” fiber. I do not really like it but for $5 dollars we do it. Continue the drive, this time on the highway, to Meknes, a city established by some great king in the 7th century. I cannot remember the name. The walls around the city are enormous, three layers of them. This was a warrior king who built stables between the walls for 1200 horses. Thousands of slaves died during the construction. The rows and rows of arches within these stables can be seen in straight line in whichever direction we look. It reminds me of the crosses at that huge America cemetery in Verdun. And the alleys created by these rows of arches created natural wind tunnels, keeping the place cool. Amazing. This king also a united of many warring tribes by having a multicultural/multiethnic harem which during his 50 year reign produced thousands of his own multiethnic children. What an ingenious ideas. According to Kamal, the king also produced a huge army of men by encouraging his young male slaves to marry young and produce as many children as possible. The male offspring were by age 15 were fully trained soldiers (I dread to think what happened to female infants). A local man gives us a short tour of the stables. He is a mad showman, with a big smile takes many pictures of us, tells stories with his hands, addresses us by some made up names. But when I note that there are no tourists his act stops suddenly and his face becomes very sad. It is difficult he says. No tourists, no food on the table. We enter the inner city for a short a time, much too short. An enormous public square and covered food market. Mountains of olives, cookies and other sweets. Philip buys a handful of sweets, I am too overwhelmed to be able to buy anything. Too soon, it is time to go back. We arrive back at Riad Myra at almost 6. Another conversation about dinner. We would really like to just wander the streets but it is impossible here in Fez, or so Kamal says. Kamal feels responsible for our safety, and also feel responsible for our “best possible meals” so he controls everything. After some negotiations we agree on the Maison Blue inside the medina. After an hour of refreshments in the room Kamal drives us to it. A huge luxurious riad, no other guests. Excellent light dinner, we try the pastille, which I love. It is a flaky round pastry filled with various ingredients, including almonds, meat or fish, raisins, spices and other things. It looks small but is surprisingly filling. I also have harira, which I need to learn how to make, once we get home. But in an empty luxurious restaurant we are not really in Morocco. We thought of strolling in the neighborhood but by 9 PM when Kamal brings us home we are too tired. A long hot bath reviews me. We stay in for the night. It is cold outside. I am not ready to leave Fez. It would be nice to wonder around here aimlessly for another day. We get an early start at 8 AM. Not exactly my idea of a vacation but we have a long drive today. Our destination is Beni Mellal, a mountain town where we will stay at a lakeside resort hotel with supposedly great views. Getting out of Fez takes longer than I expected as we drive through New Town. The usual sites of a modern city, plus beautiful private villas at the outer edges. Kamal takes side roads to show us the country but it is a slow going. After an hour we arrive at Ifrane, a mountain resort high up. Pretty soon snow covers the ground and trees and gets thicker by the minute. By the time we reach Ifrane it is a winter landscape. The village looks like a little Swiss ski resort: chalets, small hotels, cafes with French pastries. It is a gateway from people from Fez during the summer heat and for winter sports. For us this places is not especially interesting, apart from noting that Morocco has one like it. But Kamal exudes pride in showing it to us. We drive for four hours through rolling hills and occasional forests. This should be all a sea of green but this year’s lack of rain has turned it into a reddish dry landscape. The drive goes on and on, I read a book on my kindle. Philip on the front seat. We are so ready for a break when the lunch time comes. We stop in a small village frequented by truck drivers. A string of sidewalk cafes are selling hot tajins and koftas. I would like a tajin but they are too big for one person and Philip set his eyes on kofta, so this is what we have. Delicious and cheap. Next table: two German tourists, father and son, with a guide. I like that guide more than ours: he seems like a very tranquil old man, easy to talk to, a quiet listener. The next two hours take us through the fertile land and into the heart of the regional agricultural economy. Reddish silty soil, olive groves, fruit orchards (empty at this time of year), freshly plowed fields. And then we start climbing up the mountain again. A winding road chiseled into the side of a mountain, spectacular views. A huge pipe brings water from the top of the mountain to the valley below: all green, all prosperous. The towns and village we pass on this stretch of the drive are prosperous as well. Now through a mountain pass and we go partly down on the other side. It is a bright sunny and cool day (below 50 degrees). We get to the hotel at 4 PM. It is a luxurious castle-like structure with a great view. We take a walk in the neighborhood; meet a European man with a car that is missing a wheel. Trash is everywhere in this beautiful spot. There was an instructive incident with regard to trash. At some point in the day we stopped to admire the view. Many cars must stop there for people to admire the view and take pictures. There was a lot of trash on the ground. It is cold in this building designed for warmer weather. The dining room – cavernous, uninteresting and, apart from another family, completely empty– is fortunately heated. We have a simple meal on Italian theme. At some point a large group of Israelis, must be thirty or more, arrives for a buffet dinner. Loud, big boned women with large behinds and tight jeans are eating with gusto and fill the place with life. It looks like Morocco is a popular destination for Israelis; the only Muslim country in the region where they can feel safe. We feel tired after 6 hours of driving today. Tomorrow we will have a slow start. We wake up to a brilliant sun over the large and distant mountains. The last time I experienced a view like that from a hotel balcony was in Davos in 2014. And it is much warmer than yesterday. Our east-facing balcony is heavenly. But not for long. The Israelis are congregating on a terrace right below our balcony and by 8:30 their pop music is blasting at high volume. After ten minutes of listening to it I have had it. So I go down to the terrace, walk up to the small group congregating around the CD player and with an outstretched indignant arm I order them to turn off that music. No “please” or “may you’, just “turn off this music!” I do not know what possessed me. Everybody is staring, and this large defiant woman says “I do not have to turn it off”. Now we are staring each other down, and what next? What is my exit strategy? Fortunately, other people make a move and significantly lower the volume, which allows me to turn around and march off from this ridiculous situation. Our morning destination is the Ouzoud waterfalls. We drive through an arresting mountain landscape and little Berber hamlets, bee-keeping, sheep-grazing, other agriculture. Almond trees are in bloom and olive trees are covered with very early stage fruits. Once we merge with the main road we pass bigger cities and smaller towns. They are all alike: new concrete 2-3 story construction, finished in the familiar pinkish plaster, the color of the earth and bricks in this area. Hardly any trees in these cities, which is a surprise in this climate and this agricultural heaven. And a pity. There are hot-food stands along the main throughway, fruit vendors, and women on foot and on donkeys, old men sitting on plastic chairs and chatting, and general disarray. In this summer this must be heat and dust, without a relief under trees and behind shrubs. I do not understand why they do not plant trees. Kids hang out in front of a school. Teenage boys standing in a tight groups are playing some game involving clapping hands in unison. How quaint; this is the types of games we played in high school way back in Poland, and even then it was only for girls. A crowd lining up at the entrance to a family courthouse. …Life. This goes on for about two hours until we arrive at the waterfall area. To see it we need to walk down to the bottom of the gorge. We thought that this was going to be a nature walk. How wrong we were. It is stairs all the way down, with vendors selling local Berber crafts. One exciting moment comes when I take out a small cookie form my pocket. In an instant a bunch of monkeys attack me out of nowhere. They jump on my shoulders and arms, quite aggressively. I quickly shove the cookie into Philip’s mouth which gets the monkeys of my back and toward him, but Philip eats the cookie and as soon as they realize it the monkeys vanish. We lunch in an outdoor restaurant of Kamal’s choice. We order chicken tajin, which turns out disappointing. The chicken must have died of old age. But the vegetables and the sauce are very tasty. Before we depart this area Kamal introduces us to an old man who runs a tiny grain mill powered by the water. In a tiny shack at the top of the waterfall he shows us how it works. This is the same technology that has been used for millennia, and I have never seen it before. A grinding stone, a clever system for regulating a stream of grain feed, another devise to regulate the coarseness of the flour. I wonder what benefits the modern technology has over this system. It looks so efficient and effective. We tip the old man, as we tip on this trip everybody who shows us anything. Part of our function. The rest of the drive is uneventful and unremarkable. Three hours to Marrakesh. Our guesthouse Riad Djemanna has the same structure as the one in Fes, but it is smaller and less opulent. And more cozy. We have a nice large room with a sitting area and (how wonderful) red rugs on the usual cold tiled floor. There are two very inviting sitting rooms off the main courtyard. Kamal leaves us alone tonight, after we turn down his plan to drive us later to some superb restaurant outside the medina. We venture out looking for dinner. Our riad is located in a long narrow alley which I would take for a dead end nothing if I have not already learned something about Moroccan medinas. The alley turns left and right a few times. On both sides are blind walls maybe three stories high. It is a poorly light canyon, mostly empty but for an occasional person silently passing us. If I was alone here for the first time I would be frightened. Every once in a while there is a door, sometimes simple, sometimes ornate. And behind these doors are great and wonderful secrets of riads, like the ones we have been staying in. Later, as we come back from the light dinner in a street café, we encounter more live in the alley: old women talking, teenage boys congregating. We spend the rest of the evening in the sitting room with nice background music and soft couches. Three British men traveling together are playing cards. A French-speaking couple on another couch. This is the day I declare my intention to go on strike. I do not want to drive anywhere anymore and I do not want us to have company. The weather is lovely and I am going to relax for the rest of the Moroccan holiday. But before I can execute my plan we still have a full day of sightseeing Marrakesh. Our guide for Marrakesh is Zoubida, a lovely woman of about 50, with tired skin around her beautiful dark eyes, carelessly thrown together head scarf, and a warm, fun loving manner. She is educated, worldly and open to the kind of intimacy that can develop between women. I like here instantly. But she is also intense and talkative, and is so well informed that she has plenty to say. So she commands our attention and talks incessantly. We drive through the modern section of the city, built by the French who did not want to live in the medina: wide stately boulevards with international hotels, middles class neighborhoods of 4-5 story high buildings, all in the familiar reddish color. Someone told me earlier that this reddish color is meant to reflect the sun, especially at sunset. I do not believe it; I thing that this is simply the result of the centuries of producing reddish bricks from the soils in the area, and it became a signature hue for Moroccan cities. This is a city of trees and palms, much more so than any other we have seen so far. This was once an oasis on the edge of a desert. Our guide tells us that the buildings cannot go higher than 5 stories so that the view of the Atlas Mountains is not obstructed. The story we have heard – that no building can be higher that the main mosque – is not true, like many things we have bene told; it is the urban planners that decide on buildings’ height, not the religious establishment. A program is under way to plant a million trees in Marrakesh and its surrounding over the next decade or so. We do the usual sights of Marrakesh: the great mosque, the gardens of Ives Saint Laurent, the 14th century royal burial grounds (quite beautiful; the dynasty became extinct because so many members of the family, especially children, died in a plague), the royal palace (just passing by), the Vizir’s 19th century incredible palace. We go to Mellah, the Jewish quarter which is being renovated on a large scale by the government in order to attract US tourists. She tells us that it is estimated that about one million American Jews have Moroccan ancestry and thus could choose this place as a destination for personal pilgrimage. The fact that Morocco protected its Jews during the Nazi occupation is significant. We visit a synagogue built in 1492, the year of expulsion of Jews from Spain. The synagogue has been recently renovated and is still in use; there are fascinating pictures on the walls of the Jewish life in this area in the 1920 – 1950s period. These were not rich people. An old man in a yarmulke forces his way to become our guide, quite irritating, actually, but it is difficult to get rid of him. At the end I give him a tip, which is far too much but I make a mistake of thinking that I am giving to the synagogue, not to him. Oh, well. Most Jews emigrated from Morocco to Israel after its independence in 1956, not being sure how life in free Morocco would be. Those who stayed are very prosperous through various international businesses. Zoubida tells us that some of the Barber villages were descendants of Jews in Diaspora after the fall of the second temple. It would be nice to know a bit more about it. Lunch of shawarma at the Big Square. We talk about books and she gives us suggestions of Muslim writers she especially likes, and we give her our suggestions. She talks about her 19 year old daughter who studies in Germany, and about her many travels through Europe. Zoubida also tells us about the current policies toward polygamy. This practice cannot be directly challenges because it is sanctioned by sharia, the Islamic legal system based in Koran. Instead of doing that, the courts raised a bar on acquiring additional wives; the first wife must give a consent and the man must demonstrate to the court that he can afford to support additional family units. This is a clever solution. We pass a public demonstration of teachers who oppose recent public school reforms. We walk through the souk, which is very quiet today, Friday. By 3 PM we are ready to go back to the guesthouse. We say goodbye to this lovely woman. The rest on the roof terrace of our riad is heavenly. This is when I decide that I am not going anywhere tomorrow. In the evening we head for the obligatory visit to the big square Djemaa al Fna, to see street performers and so on. We climb several sets of stairs to a roof-top restaurant to get the best view but what we did not expect is that after 6 PM the temperature drops about a degree a minute and an icy wind picks up. By the time we leave, about an hour later, we are frozen through. The Big Square is what one would expect: full of people strolling and clustering around performers: musicians, belly dancers covered from top to bottom except for slits for eyes, men with a message for the audience, acrobats. The place is full of people, mostly locals. We return through the souk, amazingly Philip is able to find the way, using the map on his smart phone. It is nice to be in our guest house, with its background music and serenity. Philip goes on the planned outing with Kamal while I stay behind. My big adventure: making my way around Marrakesh by myself. I have a hand-drawn map and a GPS map on my smartphone. I head toward the big mosque, with the tall wall (behind which is the royal palace) as my guide. I sit on stone wall by the mosque for a while, watching the life go by on a Saturday morning. It is very different to do it alone than with a guide, or even just with Philip. I observe more intently. I actually see people and their comings and goings. The vendors bother me so I go to the adjacent park. The park is very French: formal, geometric. This is a beautiful morning, warm already at 11 AM. Pollution hangs in the air, no doubt from cars and the multitude of loud motorcycles (these are really just a step above bicycles, scooters). The park is quiet, free of vendors and hustlers. I sit on the bench for a while until I become aware of a pair of eyes in a male face watching me right above the line of a hedge. It feels creepy, so I leave the park, pass the stand for horse-drawn carriages, with their suffocating stench of urine, pass through the big square and follow the map toward Hammam Ziani. It takes longer than I remember from yesterday. A man on a horse passes me by in the narrow alley and a woman completely covered in chador, with only slits of the eyes, on a motorcycle. The Hammam experience is so restoring. First I sit in a steam room, then a woman takes me by the hand (I do not see with glasses or without them) and takes me to a scrubbing room. She is young and strong, barely dressed herself, not a word of English. Morocco is definitely a French speaking country. The scrubbing is wonderful, especially my perennially itchy back. The water is very warm but not too hot, perfect. She scrubs my face also, which is surprisingly pleasant. After that, a good slow massage. Back again to the scrubbing room to wash off the oils and to shampoo my hair. After I am dressed they put me in front of a mirror and hand me a hair-drier, then invite me to a salon of sorts for tea. Never mind that the tea is luke warm, I am happy. Walk back toward the square, have a sandwich in a little cafe, watching the people. This is how tourism needs to be: slow, watching, smelling, and imagining what people are saying to each other. On the big square people are milling about in large numbers. A snake charmer and his cobra and viper. His buddy takes my picture and demands 200 DH for doing so. I give him two 10 DH coins, probably much more than I should, and walk away. There is a man displaying a table full of dentures! What are they for?, I wonder, until I see that these are props for photographs. Amazing ideas people have to make a few bucks. I make my way to the hotel and soon Philip gets back from his outing to a Berber village up in the mountains. Philip was driven up into a beautiful valley with trees in soft green spring colors against the backdrop of impressive snow-capped mountains of the high Atlas, which reaches heights of 4000m (12,000 feet). Kamal stops at a restaurant to order a special tajine which needs an hour or so of simmering; he next stops at a bakery where he orders a bunch of bread loafs for us and for his family; he claims that this this restaurant and this bakery are the best. He tells me he often goes here for pick nicks with his family, like many others, to escape the summer hear in Marrakech. He finally stops at the village of destination. The village is rather unremarkable, but the backdrop of mountains is spectacular. Rather than showing me around he leaves me alone, which suits me well. I walk, climb, make photos, smile, and have a quick coffee before returning to the car where Kamal works on his computer. As agreed earlier at 2:30pm we are back at the riad. We spend two glorious hours on the roof terrace reading books and sipping tea, and around 4:30 we hit the streets for the last time. Back to the square, which is now in full swing. The two belly dancers (wearing jeans under their flowing garments) whom we saw yesterday. There is a seller of a magic potion who holds an iguana and gives a spirited lecture to the circle of men who are watching him intently. What we figure out is that he makes a mix of powder made of iguana (the whole body? Parts of it? We do not know) and several spices, and this potion makes men feel better and perform better sexually. Two men swallow handfuls of the powder and wash it down with tea. No women in the crowd. Philip and I attract attention. The beating of drums reverberates through the square. They sound to me like African music but who knows. An old man plays a violin-like string instrument. And of course there are food stands all around us. We sit at a long table and I have a bowl of harira while Philip has tea with pastry. The soup comes from an enormous cauldron and the business is brisk: both locals and tourists. I watch an old woman having a bowl of it, then she follows with a bowl of porridge from the second cauldron. I watch the men cook other dishes. It is fun to sit here in the dusk, with air nicely cooling down, and watch. We enter the souk for our last stroll. The amount of stuff for sale is enormous. Everything under the sun, but we do not buy. We do not need anything and I do not know if my kids would like anything, now that their wives decide on their furnishings. One day they will travel and buy their own stuff. We find the restaurant we selected last night. The proprietor directs us to the roof terrace because the dining rooms does not yet open, but on the terrace we find out that it closes at 7 PM, in half an hour, and that they do not serve food. So we order drinks, but then the waiter tells us that we should order our drinks in the dining rooms downstairs, which is apparently open. Things are somewhat dysfunctional here, they never bring our appetizers. But it all does not matter. We enjoy this place and this food (even though my vegetable tajin is mostly potatoes). We have wine for the first time in Marrakesh (our riad does not serve it). A very relaxing evening. Before a pick-up later this morning we take a stroll on the streets in the neighborhood of our riad. By now we know where to go. This is a morning in Marrakesh: vendors are selling fresh fruit and vegetables, women are shopping, stands with fresh pastry and tea, we pass an art gallery (free entry, we have no time to check it out). Nobody is paying the slightest attention to us, unlike the more touristy neighborhoods. I wish we spent more time on these streets during our stay. On the way out of the city Kamal drives us through a desert-like recreational area with palm trees and camel rides, and many very opulent villas. We talk about options for future visits: renting an apartment in Marrakesh, going to Sahara. Maybe. The highway drive to Casablanca takes about 2.5 hours. We should have bought return tickets form Marrakesh. At the airport Kamal treats us like children, accompanies us personally through all the usual steps until we get to the security gate. Perhaps he is required to see to it that his tourists actually depart. Good bye, Morocco and Kamal. We have seen so much on this short trip!